MotoGP legend, Valentino Rossi, arrived in Manila to personally witness Yamaha GP 5’s opening leg at SM City Sta. Rosa. Yamaha's concerted CSR efforts in rebuilding the lives of Yolanda survivors were discussed in the press conference attended by the 9-time world champion Valentino Rossi, Yamaha Motor Philippines Inc.'s President Toru Osugi, Sales General Manager Romeo Tan, Corporate Services/Logistics General Manager Alfredo Lejano and Marketing Section Manager Ryan Jude Camus. Rossi is helping raise funds for the victims of Typhoon Yolanda by encouraging everyone to purchase discounted and limited racing items donated by the MotoGP team. Yamaha’s charity effort called “Champions Rebuild Lives” is set to turnover donations to the ABS-CBN Sagip Kapamilya Foundation. 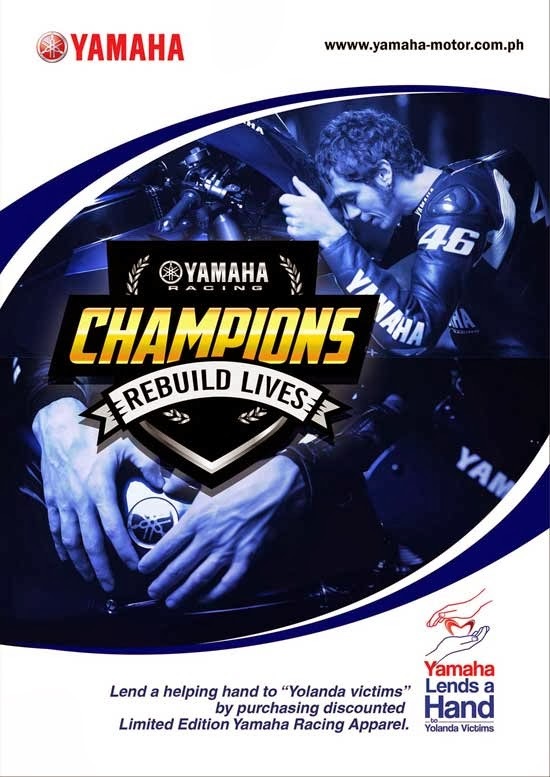 This advocacy is made possible through Yamaha’s Lend a Hand Project in coordination with Yamaha Motor Company Ltd., MotoGP, Yamaha Racing Academy and Yamaha Motor Philippines Inc.
Born in Feb. 16, 1979, Valentino Rossi, started riding at a very young age. He owes to his father, Graziano Rossi, his aspiration to become the best motorcycle racer. He began racing for the 125cc category during the Grand Prix of 1996 and won won his first World Championship the following year. He moved up to the 250 cc category and won the 250cc World Championship in 1999. His marvelous feats earned him the title “The Doctor” or “Goat,” which is an acronym for “Greatest of All Time”. His record breaking achievements is well-known as, as he is the sole rider to achieve all four World Championship titles: 125cc, 250cc, 500cc and MotoGP. After the presscon, Rossi and Mr Osugi signalled the race commencement. Changing into his racing suit, Valentino Rossi even showed the Yamaha Club presidents, local riders, media and spectators how he can easily ride around the laps in top speed. Thank you, Yamaha for making such a memorable event. I admit I know nothing about the racing world but what Yamaha is doing is really great. Kudos to them and for Valentino Rossi for doing what they can to help out Yolanda victims. Wow, I didn't know Rossi was here! I'm happy to know that people are still coming in to help even if it has been months since the tragedy. It's good that Yamaha is helping Yolanda Victims. Thumbs up to them. Wow! I'm surprised that Yamaha has events like this. Kudos to them!